Available on Guero and 4 other releases. Originally, there were a number of reports about a song called "Outerspace" which was to be on Guero. This title was changed at the last minute to "Broken Drum," and it is the eighth song on Guero. Did the lyrics change at some point, or there is an earlier version with references to space in the lyrics? Or maybe the original title just referred to the spacey music? "Broken Drum" is a chorusless, moody song, consisting of waves of guitar over a mechanical beat. Classy touches of piano and slide guitar add natural flavor. The recording and song is much more clever, in my opinion, than first meets the ear. Beck is essentially a one-man band on the song, playing every instrument, only sharing a producer credit with Tony Hoffer. (Interestingly, no electric guitar is credited officially, though the acoustic guitar is. Probably just an oversight.) But the striking landscape of music Beck creates for the song is probably my favorite thing on Guero. It feels dark, but at the same time, alive and three-dimensional. Beck has said that Elliott Smith's death occurred early during the Guero sessions, and that shock and grief ended up in a few of the songs. I can only assume this is one; though since it was recorded with Tony Hoffer, and not the Dust Brothers, we can also assume that "Broken Drum" originated outside the actual Guero sessions. Regardless, the last few verses, at least, reference the loss of a friend. Reading the lyrics cold, they don't necessarily encompass the emotion that comes from hearing them sung. They can feel a little plain in spots, but the music turns that feeling inside out, giving an incredible depth. Beck played "Broken Drum" at a high percentage of all 2005 and 2006 shows (the Guero and Info tours). 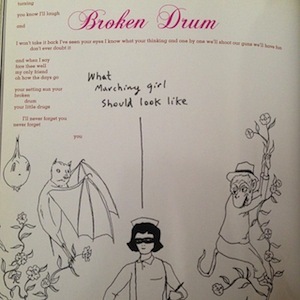 For a couple of years, "Broken Drum" was both a regular in the setlist, and basically the showstopper. Even though it doesn't have all the instruments of the record, it loses none of the subtlety. And it's all infused with such life! Seriously, I just listened to as many of them in a row as I could (as research) and I'm not tired of it. I LOVE what they do to the song. These 2005/2006 versions are based around a fairly nasty keyboard sound, which the rest of the band plays off of--a little piano, some feedback, Beck's vocals. The outro guitar part doesn't always sound exactly the same either, though it always builds into a beautiful stormy noise. Beck didn't tour much in 2007, but there's a couple more versions from that year (lingering Info tours in Australia and Japan). And in fact, the 2007 one I know is one of the best I've ever heard (April 9 in Osaka). Beck hit the road for the second half of 2008 with a new band, behind Modern Guilt, and did not perform "Broken Drum" at all. He brought it back at 3 of his Japanese Guilt shows in March 2009, however. Still impressive on stage, though this band feels like it rounds out the edges of the song a bit. I prefer the sharper versions of 2005/2006. One interesting thing about "Broken Drum" is it never moved from main sets, nor strayed from the arrangement (though there is room for improv in there some). There's no weird electro versions, nor Beck trying to play it on acoustic guitar, nor bits of it in medleys. If the band couldn't do it full-on, they didn't.